WE ARE HERE TO PROVIDE A LOVING ENVIRONMENT WHERE EACH CHILD MAY DEVELOP PHYSICALLY, MENTALLY, SOCIALLY AND SPIRITUALLY. WE ARE A CHRISTIAN PRESCHOOL WHERE BIBLICAL PRINCIPLES AND MORALS ARE TAUGHT. We are open Monday through Friday from 6:30AM to 6:00 PM. Come by any time, or contact us with email. Carmen Baugh is the director. Her email is Baugh5fam@aol.com. The phone number at the school is 209.815.9341. 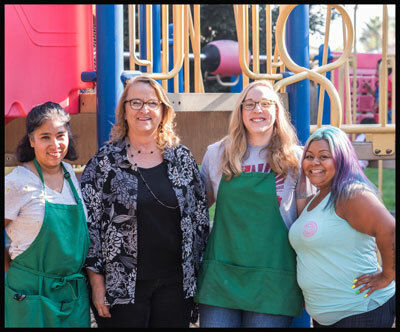 We wish to welcome you and your child to Sequoia Christian Preschool. We hope your child's stay with us will be happy and secure. We are a Christian preschool where Biblical principles and morals are taught. Please feel free to speak to the Director about any questions or problems you may have. Thank you for giving us the opportunity to take care of your child. We take this responsibility very seriously. Half Day is from 6:30 AM to 1:00 PM. A Full Day is 6:30 AM to 6:00 PM. Children must be dropped off by 9:00 AM every day to participate for that school day. Your child is enrolled for a set number of days per week. You will be charged for these days, even when your child is out due to illness. You will also be charged for the days that we are closed for holidays and staff training. Sequoia Christian Preschool charges tuition by the month instead of the week. Therefore, tuition is the same amount for those months that have five weeks. This is intended to offset the cost of tuition for those days that we are closed. "All scripture is God-breathed and is useful for teaching, rebuking, correcting, and training in righteousness, so that the man of God may be thoroughly equipped for every good work." 2 Timothy 3:16 and 17. Early childhood is a critical time in the development of a child's perceptions of self, others, the world, and God. The goal of the Christian preschool's curriculum is to stimulate the child's physical, mental, emotional, and social development while maintaining a strong spiritual emphasis throughout.